In 1828 pressure was building among white Americans for the relocation of American Indians from the eastern United States to lands west of the Mississippi River. A student at a mission school in the Cherokee Nation, which lay within the chartered borders of Georgia, North Carolina, Alabama, and Tennessee, demanded to know, “they have got more land than they can use, what do they want to get ours for?” American Indians have grappled with that question ever since Europeans arrived, and historians have tried to understand exactly what motivated hostility to Indians, especially peaceable groups such as the Cherokees and others, who were ejected from their homelands in the early nineteenth century. In this period, the dispossession of Indians fell under a federal policy called “removal,” taken from the title of the 1830 Indian Removal Act that authorized the negotiation of treaties to rid the east of American Indians. The use of that neutral sanitized term obscures both the motivations and effects of the policy. European legal principles, which the United States inherited, recognized a “right of discovery,” which gave title to newfound land to the Christian, “civilized” European nation that discovered it and limited the rights of indigenous “savage” peoples to occupancy. When Native people died out, moved away, or forfeited their rights, the European title became absolute. In order to cement their title, colonial governments recognized the legitimacy of tribal governments by entering into treaties with them, something only sovereign nations do. Treaties that regulated trade, cemented alliances, and provided for the cession of land became a cornerstone of US Indian policy. In the 1820s, however, some politicians, most notably Andrew Jackson, began to question the practice of making treaties with, and thereby recognizing the sovereignty of, Indian nations. This change of heart accompanied an intellectual shift in the United States and Europe. The Enlightenment idea that “all men are created equal” had shaped US Indian policy in the three decades following the writing of the Constitution. Cultural disparities, policy makers had thought, stemmed from education and opportunity, not inherent differences. Therefore, American Indians could be “civilized” and assimilated into white American culture as individuals. The United States appointed agents to live among the tribes, hired farmers and artisans to teach the Indians skills, and provided funds for missionaries to establish schools and churches. These efforts had barely gotten underway when objections arose. By the 1820s, new ideas about human differences as immutable had begun to emerge on both sides of the Atlantic. In Europe, for example, the Congress of Vienna in 1815 had tried to redraw the national boundaries of post-Napoleonic Europe to reflect the supposed innate differences among people. The assumption that distinct cultures reflected racial differences began to take hold in the United States, and policy makers increasingly believed that American Indians could not be assimilated. Once an Indian, they believed, always an Indian. Furthermore, their differences meant that Indians and whites could not live together. Sometimes called “Romantic Nationalism,” these views contributed to the decision to force Native peoples from the East, as well as to subsequent atrocities on both sides of the Atlantic for more than a century. The decisions that some Indian nations made seemed to support the tenets of Romantic Nationalism. Some tribes, such as the Shawnees in southern Ohio, experienced a revitalization that dramatically conveyed their preference for their own culture. Many tribes, on the other hand, welcomed the education and practical skills that missionaries and agents brought, but expressed little interest in Christianity or assimilation. Among peoples in the Southeast, in particular, the “civilization” program simply better equipped leaders to defend their nations’ sovereignty. The Cherokees, for example, developed commercial agriculture, operated toll roads and ferries, adopted a writing system, published a bilingual newspaper, and instituted a constitutional government that took Georgia to court when the state infringed on its tribal sovereignty. The Cherokees and other tribes adopted aspects of European culture while preserving many of their own practices and beliefs, and they defended their right to make decisions for themselves. The dissolution of their nations and assimilation into the United States were not on their agendas. Native peoples east of the Mississippi confronted demographic changes that made their positions increasingly untenable. The original thirteen states had transferred their western lands, granted in colonial charters, to the United States. Indians lived on much of this land, and the intrusion of white settlers led to unrest and violence, especially north of the Ohio River where an alliance led by the Shawnee brothers Tenskwatawa and Tecumseh resisted encroachment before meeting military defeat in 1811. They failed to stop US expansion, and by 1820, the number of states had risen to twenty-two. Older states feared loss of revenue and political power as new states emerged, and those with American Indian populations eyed Native lands. Georgia, home of the Creeks and Cherokees, led the charge to dispossess Indians. The sentiment was widespread that people as fundamentally different as Indians and Europeans could not live next to each other and that the Indians had to go. Eliminating property requirements for voting, increasing the number of offices directly elected, and other democratic reforms in this period made removal a potent political issue that demagogues used to inflame voters who either lacked land or wanted more. In 1828 Americans elected Andrew Jackson president. Jackson did not succeed in convincing legislators to abandon treaty-making; instead he cynically used treaties to expel five large southern tribes. In 1830 Congress passed the Indian Removal Act, which authorized the President to negotiate treaties for the removal of eastern Indian nations and appropriated $500,000 to accomplish that goal. Given the disdain with which Jackson regarded Indian treaties, it is not surprising that some of this money went to bribe chiefs to sign removal treaties. Treaty commissioners appointed by the United States also negotiated with unauthorized parties, circumvented established protocol, and lied, cajoled, and threatened in order to achieve land cessions. The President used the Indian Removal Act to target southern tribes, many of whom lived on prime cotton-growing land. In 1830, a rump council of the Choctaw Nation agreed to removal after the full council refused. Two years later the Chickasaws surrendered their land east of the Mississippi River only to discover that there was no land west of the river for them, and they were forced to merge with the Choctaws. Having signed a removal treaty, the Creeks became victims of such violence from white Americans that whites feared retaliation, and the United States removed the Indians as a military measure. While Seminole leaders were touring land in the West, their escorts pressured them into signing a treaty that they repudiated upon their return home. And when the Cherokee Nation refused to sell, commissioners convinced a small, unauthorized faction to sign a removal treaty. Southern Indians have received the most attention from historians, but they were not the only victims of removal. The Oneidas from New York and the Stockbridge people from Massachusetts sought refuge in Wisconsin to escape white harassment and encroachment on their lands. The state militia forced the Sauks from their Illinois lands to Iowa in 1831, and a year later in the Black Hawk War, the Illinois militia attacked a starving group of Sauks whom Black Hawk had led back to their homeland. Ultimately, the Sauks lost their lands in Iowa and most moved to Kansas. From the Old Northwest, the Ho-Chunk, Potawatomi, Shawnee, Miami, Wyandot, and Delaware peoples also lost their lands and moved to what would become Kansas and Nebraska. Each of these removals occurred under different circumstances, but all were fraught with anguish and loss. Although it was no longer the focus of federal Indian policy, removal did not end in the 1840s. Efforts to transport remnants of removed tribes continued into the twentieth century. In 1903, the United States tried to get Choctaws in Mississippi to move to Oklahoma and receive allotments of land, but the effort met with little success. At the end of the twentieth century, some Choctaws believed that the United States would make yet another attempt to remove them. The continuing fear of removal magnified the sense of loss that Native people felt, and some scholars suggest that their grief became trans-generational. Parents passed the despair they felt on to their children, affecting their physical as well as mental health. Although we use the term “removal,” the United States actually engaged in ethnic cleansing when it forced Native Americans west of the Mississippi. By 1830 most white Americans did not believe that Indians and whites could live together, and they thought that Indians held resources, especially land, to which whites were entitled. Democratic institutions meant that Native peoples, who had no vote, could be dispossessed by those who did. As a result, Alexis de Tocqueville wrote, the United States expelled Indians from the East “with wonderful ease, quietly, legally, philanthropically.” The insistence of the United States that its policy was just should lead modern Americans to contemplate not only why their ancestors so desperately wanted Indian land, but also how they justified taking it. 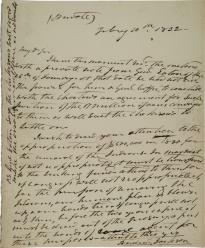 Nancy Reece to Reverend Fayette Shepherd, Dec. 25, 1828, John Howard Payne Papers, Newberry Library, Chicago, Ill.
 Alexis de Tocqueville, Tocqueville: Democracy in America (New York: Library of America, 2004), 391. Theda Perdue, Atlanta Distinguished Professor of Southern Culture at the University of North Carolina at Chapel Hill, is the author or co-author of nine books including Cherokee Women: Gender and Culture Change, 1700–1835 (1998), which won the Julia Cherry Spruill Award for the best book in southern women’s history and the James Mooney Prize for the best book in the anthropology of the South. More recently, she has published Race and the Atlanta Cotton States Exposition of 1895 (2010) and, with co-author Michael D. Green, The Cherokee Nation and the Trail of Tears (2007) and North American Indians: A Very Short Introduction (2010).